Stripe rust has surfaced in SouthEast Idaho after a cool, damp, spring. 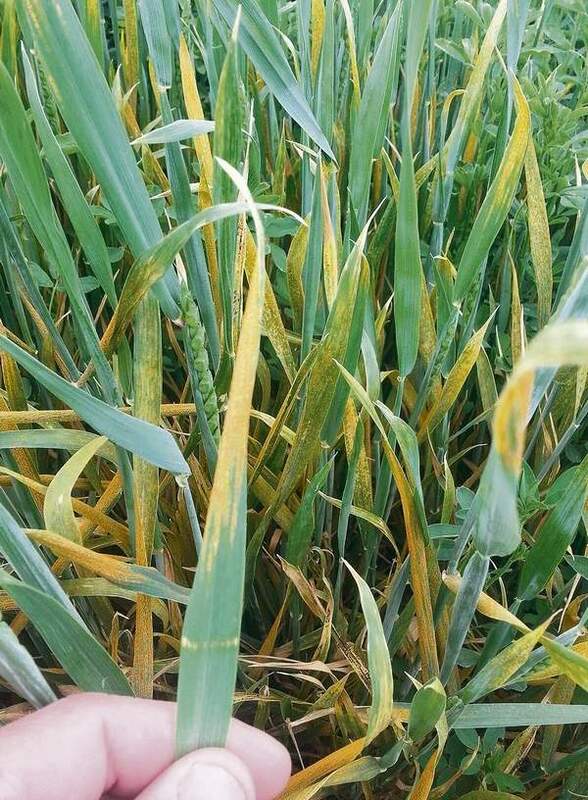 AMERICAN FALLS, Idaho — Cereal crop experts have discovered stripe rust infections in three areas of southeast Idaho and warn cool, wet weather could result in heavy disease pressure this season. Marshall said the potentially devastating fungal disease, spread by orange and yellow airborne spores, has been widespread in Logan, Utah, with infections continuing north into Preston, Idaho. Stripe rust has also been reported in the Seagull Bay area near American Falls Reservoir and in Arbon Valley. In recent weeks, Marshall said stripe rust has spread into California, Oregon and Washington, and heavier spore loads could soon blow into Idaho. Marshall said no stripe rust has been found yet in UI cereal variety trials in Aberdeen and Tetonia. About a month ago, Chris Merrigan, a crop consultant with J.R. Simplot, Co., confirmed stripe rust in a field in the Seagull Bay area near American Falls Reservoir. Merrigan said between 10 and 20 percent of the irrigated field, planted in a resistant wheat variety, was infected. However, Merrigan said the field was planted in wheat for consecutive seasons, elevating the infection risk, and he doesn’t believe a fungicidal seed treatment was used. Merrigan said spring grain growers still have time to mix fungicides with their herbicide sprays to prevent the spread of stripe rust, and he urges them to do so. Lonnie Sparks, a crop consultant with CHS Bingham Cooperative, identified stripe rust in downy brome growing between two irrigated spring wheat fields in Arbon Valley. Based on the discovery, Sparks said the grower mixed fungicide with herbicide used on fall wheat fields planted in a susceptible variety, Brundage, and plans to spray fungicides on his spring wheat as well. Sparks also advised the grower to kill the weeds with a mixture of glyphosate herbicide and fungicide. Marshall said she’s beginning to see cases of root rot in fall wheat fields that were heavily saturated with moisture, as well as pythium outbreaks in spring wheat. Pythium is a water mold that thrives when crops are planted in cool, wet soils, and can cause heavy damage to newly emerging crops with undeveloped root systems. The good news, Marshall said, is that barley yellow dwarf virus doesn’t appear to be widespread in Idaho this year, as it has been during the past few seasons. Marshall said the virus, which is spread by aphids, has been confirmed in a few fall barley fields in the Murtaugh, Rupert and Burley areas. She believes growers have minimized the spread by delaying planting of fall crops until aphid migrations have passed and by using insecticidal seed treatments. ARBON VALLEY, Idaho — Grain merchandisers in Southern and Eastern Idaho say upwards of half of the regional dryland wheat production has been sold into feeder channels, due to widespread problems with low protein levels. In a typical year, buyers would blend low-protein wheat with high-quality grain and sell it to millers. But there’s a glut of wheat on the market now, and prices of milling wheat are so low, growers are finding they can get a better deal by selling their wheat for feed, once discounts for low protein are factored in, explained Denis Capson, an Eastern Idaho merchandiser with Scoular. With so much good wheat to choose from, Capson said, feed lots are being more selective and have been turning away wheat with a low test weight, which they would normally buy. In the American Falls and Aberdeen area, Capson said feed wheat is selling for $3.40 per bushel. 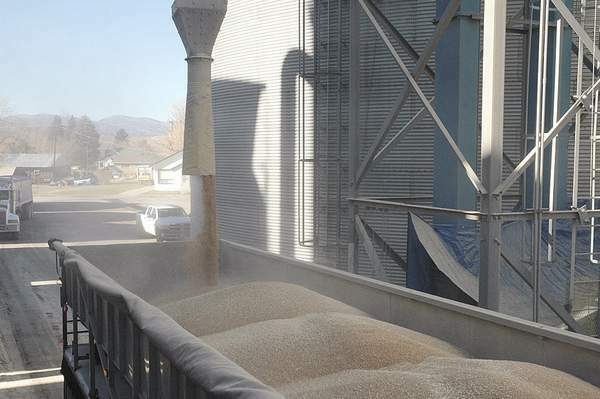 “We’re moving huge volumes of feed wheat — a couple of hundred thousand bushels per month (in Eastern Idaho),” Capson said. According to an Oct. 9 USDA report, projected U.S. ending wheat stocks for 2016-2017 are 1.14 billion bushels, compared with ending stocks of 752 million bushels from the 2014-2015 season. “The mills are filling up quickly,” Capson said, adding a decline in exports has contributed to the surplus. For several reasons, the region’s dryland growers had an especially hard time meeting protein benchmarks this season. Arbon Valley dryland grower Hans Hayden explained his yields were up 25 to 50 percent, leaving less nitrogen for each kernel. Nitrogen is needed to boost protein levels, and irrigated growers have the advantage of applying nitrogen throughout the season in their water. Hayden also suspects a lack of summer rain prevented nitrogen from moving deeper into the soil profile to plant root zones. Hayden had hard red winter wheat protein levels at 8 percent — buyers start to discount below 11.5 to 12 percent — but he had enough good spring grain to blend up his protein levels to just meet milling standards. “Most of my neighbors found the price at the feed lot better than the price at the mill,” Hayden said. Arbon Valley dryland grower Ken Campbell sold about 90 percent of his wheat to feeders. “They’re giving me a better price, and you don’t have to make grade,” Campbell said. Soda Springs dryland grower Sid Cellan sold 30 percent of his crop as feed. For feed lot owners such as Dwayne Skaar, of Lewisville, an ample supply of feed wheat cuts costs significantly. His ration is typically half wheat and half corn. “We can get wheat in there cheaper than corn because of the freight,” said Skaar, who buys corn mostly from the Midwest and is now feeding his cattle locally sourced soft white wheat. A truck is loaded Nov 8 at Scoular's Bancroft elevator with dry-land wheat being shipped to feeders due to low protein content. Much of hte dry-land crop in Southern and Eastern Idaho will be used as feed this year. Vote Yes on a Once-in-a-lifetime Opportunity! Power County can only buy these water rights if two-thirds of voters or 66.7% vote yes. We encourage all citizens to attend one of the Town Hall Meetings and learn more. This is a once-in-a-lifetime opportunity to protect and secure the future of our community and children. John O’Connell/Capital Press Arbon Valley, Idaho, grower Jeff Campbell, son of Ken Campbell, plants fall wheat, benefiting from recent moisture. 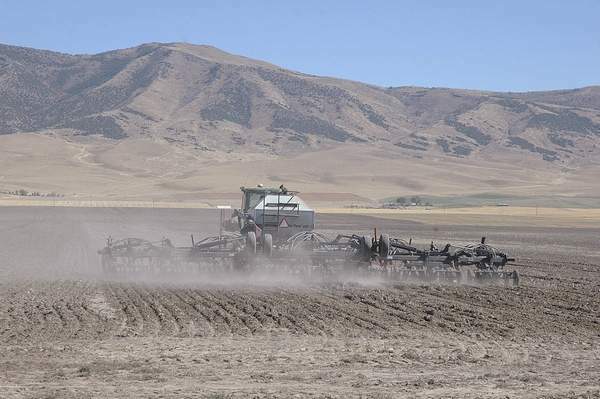 ARBON VALLEY, Idaho — Recent heavy rainstorms throughout Idaho have stretched the irrigation supply for some growers, following a dry summer, and supplied the necessary soil moisture for dryland farmers to plant fall grains. The return of moisture to the state has been a mixed blessing for other growers, however, delaying potato harvest and the planting of fall grain in fields coming out of spuds, and damaging some fourth-cutting alfalfa. Ken Campbell, a dryland farmer in southeastern Idaho’s Arbon Valley, normally likes to plant his fall wheat in late August or early September. This fall, however, he was forced to wait until the end of September to start planting, during a break in the storms that supplied him with enough soil moisture to germinate his fall wheat seeds. Before the storms arrived, however, Campbell worried about a mid-October insurance deadline, when he’d be forced to plant, even if the soil remained dry. “We all felt like we’d probably get (rain), and we did, so I’m glad of it,” Campbell said. 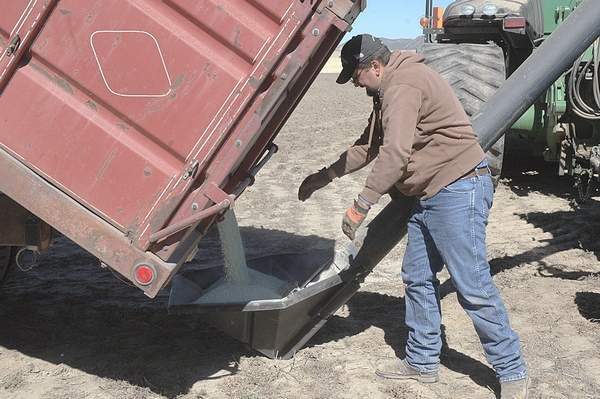 John O’Connell/Capital Press Arbon Valley, Idaho, dryland grower Jeff Campbell, son of Ken Campbell, loads fertilizer into his planter Sept. 27 before planting fall grain. He benefited from recent rainfall that restored his soil moisture. Sid Cellan, a dryland grower in Caribou County, said grain harvest and fall grain planting are mostly complete in his area — though the majority of the barley has remained in farm storages as the malting companies are still working through last year’s crop. His region received 2.7 inches of moisture within the span of a week, and recently planted fall wheat has already begun to sprout. He said the moisture has also “mellowed” the soil and made his fall tillage much easier. “There was some uncertainty at planting, but now we’ve got plenty of rain to get the grain up,” Cellan said. Steve Howser, general manager with Aberdeen Springfield Canal Co., ran out of water and had to shut off his canal system a few weeks early. The recent rains have brought his natural flow water rights back in priority, and he’s reopened his gates, hoping to resume deliveries for sugar beet growers who moisten fields before harvesting. He said some growers have already started harvesting beets along the canal, benefiting from the rain. “It’ll be very comforting if I can have water in the canal for them if they need it,” Howser said. For other growers, the timing made the rainfall mostly a nuisance. According to a USDA crop progress report for the week ending Sept. 25, moisture damaged cut beans and alfalfa in Jerome and Twin Falls counties. Caribou County potato farmers have had their spud harvests delayed by more than a week already, said Grace seed grower Marc Gibbs. Gibbs must harvest spuds before he can plant fall wheat in the same fields and noted his fall grain yields tend to drop by 10 to 15 percent when he plants after Oct. 10. The massive wildfire reported on the Fort Hall Indian Reservation on Wednesday afternoon is now listed as 10 percent contained. Fort Hall Fire Chief Brian Briggs said the blaze, which is located in the Starlight Creek area of Arbon Valley, has burned more than 4,000 acres. However, as of 6 p.m. on Thursday, Briggs said no evacuations were issued. 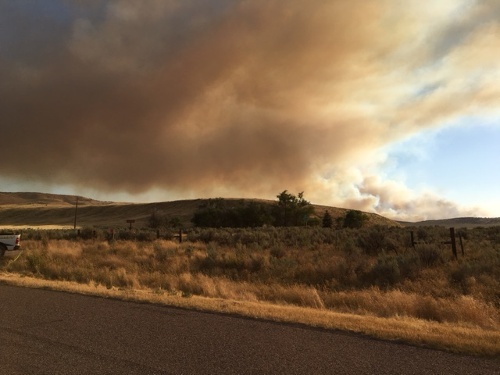 Firefighting resources from the Idaho Falls District Bureau of Land Management, Caribou-Targhee National Forest, Power County and Chubbuck fire departments assisted tribal resources. Briggs said the short turnaround time for refill at the tanker base at the Pocatello Regional Airport made air support an effective tool in limiting the spread of the blaze. 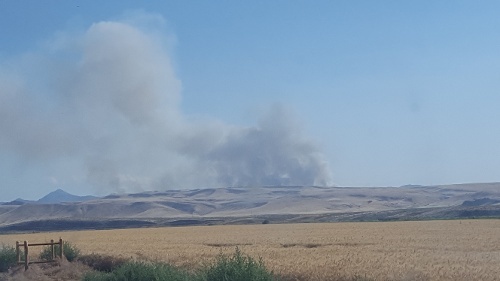 The Eastern Idaho Interagency Fire Center reported that officials underestimated the size of that fire on Thursday morning, which was mapped at 3,106 acres. However, officials expected the fire to be fully contained by Thursday evening. Fire activity was minimal throughout Thursday and was mainly confined to interior areas, where heavy fuel pockets continued to smolder. The cause of the fire in Arbon Valley is still under investigation, but officials said on Thursday that the fire most likely resulted from lightning that passed through the area several days ago. The wildfire is burning primarily in grass and sage intermixed with pinyon and juniper trees. Minimal personnel will continue to monitor the blaze and patrol the perimeter until the fire is completely out. As of Thursday, there are 14 fire engines, one helicopter, four dozers and one fire crew on the scene. 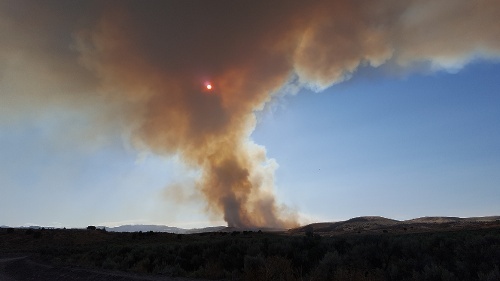 The Lone Pine Fire, which was caused by lightning and burning about seven miles northeast of Fort Hall in the Ross Fork Creek area, is listed as contained but not controlled. Between 1980 and 2015, the region has averaged about 40 wildfires each year with an average of almost 54,000 acres burned each year, according to the Eastern Idaho Regional Fire Center. However, acres scorched this year have already exceed the 2015 numbers. 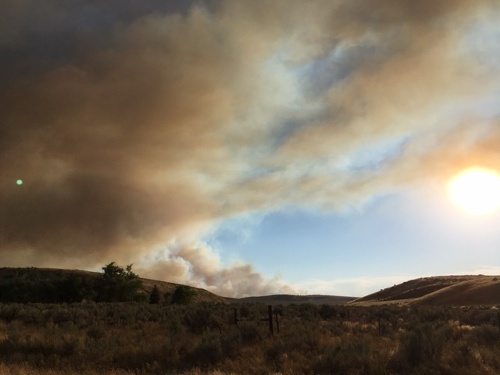 Last year, 1,380 acres were burned by wildfires in East Idaho, compared to 5,147 this year. So far this year, human-caused fires have scorched 782 acres in the region. In 2016, more than 600,660 gallons of flame retardant has been shipped out of the air tanker base in Pocatello.